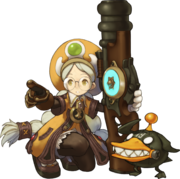 Academics excel in artillery-based ranged combat which is mixed with her inflict negative effects on opponents. Academics boast better-than-average mobility and impressive attack, but cannot withstand a prolonged direct onslaught of enemy fire. To compensate for this, the Academic has the ability to summon Alfredo, a mechanical ally that can provide protection and deal damage to assist the Academic or when the Academic needs aid while hunting alone.